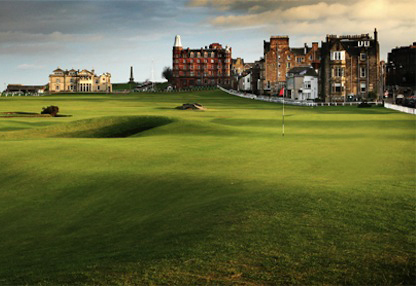 Win a pair of hospitality tickets at the Alfred Dunhill Links Championship, ST ANDREWS. Be part of the experience of the Alfred Dunhill Links Championship at the Old Course, St Andrews, the oldest and most iconic golf course in the world. The Alfred Dunhill Links Championship has earned a glittering reputation for delivering a fusion of fun, celebrity-spotting and world class golf as a flagship event of The European Tour, offering days of high quality entertainment. We are offering a Golfers Club member the opportunity to win a pair of hospitality tickets to this fabulous event on its final day, 5th October 2014. You will enjoy the experience from the Dining Club, situated in the Old Course Hotel overlooking the 17th, the famous Road Hole. Privileged car parking also provided. Question:Who won the Alfred Dunhill Links Championship in 2013? Should you not be lucky enough to win these tickets, you still won’t miss out as The Championship are offering Golfers Club members, 50% off final day ticket price, so you can still soak in the atmosphere at this great event.